I don’t mean to be overly dramatic but it’s true. This recipe can help you avoid going crazy in the kitchen while cooking big holiday dinners. 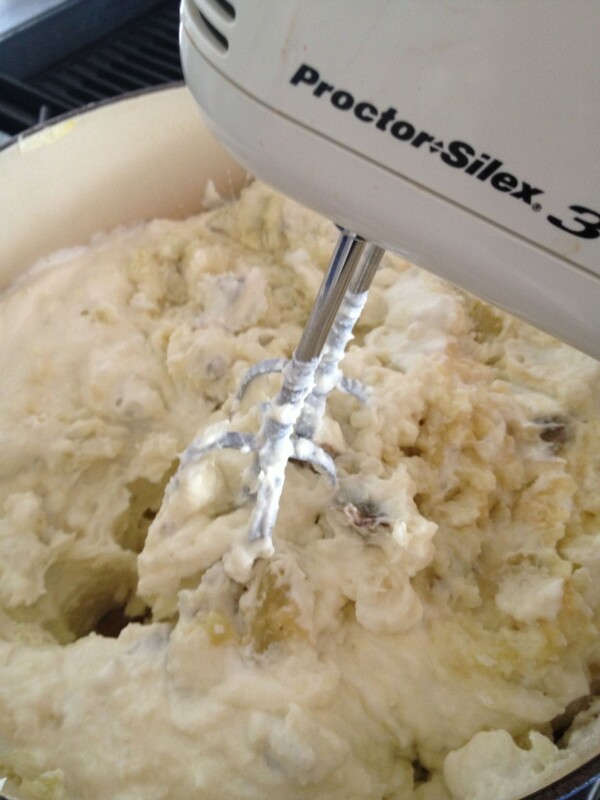 When I prepared my first Thanksgiving dinner years ago, mashing potatoes at the last minute gave me a full blown panic attack. How are you supposed to mash potatoes and make gravy at the same time? Dear readers, this is impossible, it cannot be done. My kitchen was tiny and hot, the potatoes were lumpy, everything was going to burn up or turn out raw, and I had two toddlers and two cats running around my ankles, hungry guests in the living room, an anxious husband, and I was in tears. 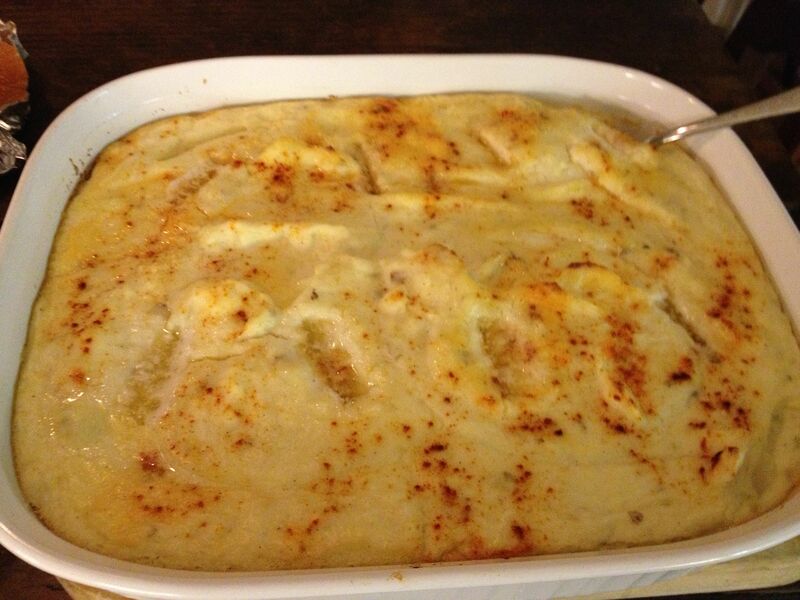 Learning about mashed potato casseroles saved my sanity. You may already know about this but in case you don’t here’s what you do: you make the potatoes in a casserole the day before Thanksgiving! Or the night before or the morning of. The point is that it’s made ahead of time and then simply slipped into the oven to warm up, while you calmly make gravy and have another glass of wine. Figure on one potato per person (I usually use medium large russets, but smaller ones will do. I cut the russets in quarters (cut smaller ones in half). Do Not Peel. Life is too short for peeling potatoes. Besides when you boil them some of the skins slip off and the ones left are good for you. Place the potatoes in boiling salted water for 10 – 20 minutes or until a fork pierces them easily. Drain in a colander and return to the pot. Add a generous chunk of butter and let melt, add some half and half or canned carnation milk, sour cream (this can be combined with plain yogurt) and salt and pepper to taste. Mash until broken down and then with an electric beater beat until creamy, adding more sour cream and/or cream as needed. You want this to have more liquid than normal mashed potatoes, but on the other hand you don’t want it to turn into soup. Pour in a casserole dish, sprinkle with paprika and sink little cubes of butter into the potatoes, cover and place in fridge for up to a day or two. When ready to serve, uncover, bring to room temperature, pre-heat the oven at 350 or lower, then bake for half an hour or until hot, depending on how deep the casserole dish is. A shallow one will let it heat up faster. And then you calmly dish up the most delicious mashed potatoes you’ve ever tasted. Or so I believe. Of course each forkful contains about a thousand calories but that’s okay because it makes your family and friends happy and you only eat it once or twice a year. Personally I love rice with turkey….and i have a rice cooker. A rice cooker! I just got one. I call it Darth. It destroys any rice I put in it.